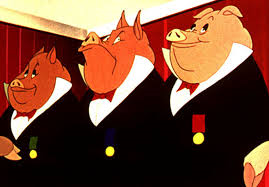 The pigs I am referring to are the pigs of George Orwell’s Animal Farm: the Communists. The animals that think they are ‘more equal’ than others. As a ‘pig’ myself, this is not an argument against pigs. Rather, I seek to answer the problem thrown up by ‘uneven consciousness’: how to give these people the organisation structure to intervene effectively in the class struggle & to spread their revolutionary class consciousness without them becoming a class in themselves? As many are aware, this subject has a long history. The debate has centred upon the role of a workers’ state & the internal organisation of revolutionaries. The Paris Commune of 1871 was arguably the first ‘workers’ state’. Today revolutionary groups do not define themselves by it, but they still do in regards to the Soviet Union. For Stalinists it was a workers’ state, for many Trotskyists it was a ‘degenerated workers’ state’, for Anarchists is was a ‘coordinator class state’, for others it was a form of ‘state-capitalism’. Did the Soviet Union act in the interests of working class or not? This is an important question, but more than a quarter of a century after the fall of the Berlin Wall & almost a century after the Russian Revolution, it should surely not be a reason for revolutionaries to organising themselves in separate groups. The self-defined ‘Leninist’ organisations of today, most better described as sects, have placed ‘democratic-centralism’ at the heart of their internal structures. As many recruited to sell papers have found out, they are anything but democratic. A small elite, often centred around a dominant individual, get themselves elected year after year & become an entity that live off member subscriptions & the proceeds from paper sales. This ‘Leninism’ is being demystified thanks to the work of people like Lars Lih & Paul Le Blanc. Whatever one may think about Lenin’s Bolsheviks they had far more open debate & disagreements than many of today’s revolutionary organisations tolerate. The idea of unity in action following democratic debate is not something invented by Lenin, it’s how just about all organisations work, whether political or not, yet the term ‘democratic-centralism’ has become a fig-leaf to cover the delusions of a small number of largely middle-class intellectuals who have little in common with, & therefore no appeal to the workers they seek to unite. This lack of connection with working people, with some exceptions, is a symptom of the Stalinist shadow (communism’s bad name) & the post-war boom (why seek an alternative when you’re getting better off?). Neo-liberalism’s assault on organised labour has also pushed back class consciousness. Those left holding the ‘red flag’ are largely middle-class who discovered Marx at university. ‘Ordinary’ people cannot relate to them, probably seeing them as being more like their bosses at work. That’s not to say we have a three class system as some Anarchists argue, but just to recognise the reality that there are those who seek to co-ordinate & who love power. A revolutionary organisation should seek to get the most out of such ‘co-ordinators’ whilst preventing elites forming. To this end I suggest the most useful thing revolutionary organisations can do is adopt ‘participatory democracy’. This simply means striving for equality in decision making as much as possible. It doesn’t mean there shouldn’t be designated roles to which people are elected, e.g. membership secretary or treasurer, or that the elected officers shouldn’t meet regularly as a ‘central committee’. It just means letting the membership have their say. In today’s internet world this is easily achieved. Just what questions, & how these questions are worded, is up for debate. It may be the central committee officers are entrusted with this, or a specially elected separate body. Different ways can be tried to see what works & things will evolve. The key point is members feel they can have their say, & that even if they are in a minority, are more likely to get behind a decision they have been consulted on. Democratic debate followed by unity in action. Such a structure is less likely to be taken over by an elite if all are non-professionals, i.e. they have to go to work just like the workers, rather than living off them. Why should a membership secretary be a full time post? Can’t these jobs have ‘deputies’ if someone needs to be always available? Where ‘professionals’ are needed, e.g. the editor of a weekly paper, there should be strict time limits. Again, all to prevent elites forming. Participatory democracy is not just for revolutionary groups, but also the movements they create & support. In Britain the People’s Assembly Against Austerity has attempted to bring together a broad range of people including trade union activists & Occupy-types. For it to include the latter it must adopt something close to participatory democracy. So far it hasn’t, despite a promising first national conference. It’s website doesn’t encourage participation. With a renewed phase of the economic crisis immanent, & ever more cuts they need to move up a gear. People’s Assemblies nationwide, even worldwide, can play an important role in developing working class consciousness & increasing the number of revolutionaries. Slogans are also important. What is telling here is in recent times the ones that have connected have not come from the Leninists but from those with a less hierarchical view of organisation: ‘Another World is Possible’ was the slogan of the World Social Forum & ‘We are the 99%’ from Occupy. Once again suggesting revolutionaries are not as connected as they should be. Finally, one concrete way revolutionaries of different shades & opinions can come together & engage the working class, particularly the young who are more likely to be unemployed or paying exorbitant rents to landlords, is by creating a non-corporate Facebook-plus website. A site paid for by revolutionaries that offers not only social networking, but also entertainment (all free music, films, books, games), personal organisation (calendar, contacts, tasks, photos, documents), education, (home-teaching, parental support, on-line degrees, revolutionary ideas), & sharing (landshare, travelshare, sheltershare, etc). All under a single website (e.g. ourworld.org). This requires a serious commitment, engaging the unpaid work of many non-revolutionaries, but has the advantage of giving people, a lot of people, a glimpse of what a world without profit looks like. A view that can start to counter the distortion of Stalinism & Leninist sects. A world where all animals are equal.